Ironhead Anyone hunting an XLCH in a Norton Featherbed Project? Anyone hunting an XLCH in a Norton Featherbed Project? Just testing the waters, there is one here that needs a new home. thumbnails that might take you to a larger pic if you click on them? Does anybody wonder why you never see one of these with a rear chain? Damn that looks like a tasty project. I like the Suzuki 4LS drum... friggin heavy but very effective if sorted. I have pix of it with a chain. 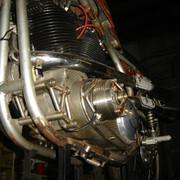 One of the first obstacles is the scant room to clear the frame without largely offsetting the engine from the centerline. 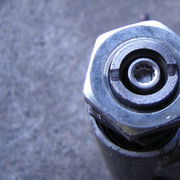 So, this was addressed by making the swingarm rotate on timkens adjustable designed and engineered to provide a slight amount of side to side and bearing preload adjustment. Then the new sprockets went on, the rear is custom made although off the shelf units pop right on, with the front 25T having been machined to offset inboard, and that is where it is. Thought about machining both to run a o-ring 520 chain which is just a bit thinner than a 530. 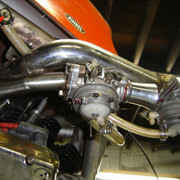 650 triumph swing-arm with drop-outs flipped and heavy shock mounts added to its new upright. The oil bag triumph swingarm I believe is an inch and change longer than the Atlas' and stock, the featherbed is rather short in wheelbase, around in the 52-54 inch range if I recall correctly. They were GP short and a bit twitchy and flicky. Now it is around 55" rear wheel mostly forward. headlight (guess the year, make and model, it's rare) and maybe even the tach mount with tach and even steering damper if you want zero flab, and get it down under 320 pounds for some standing start sprints or drag racing. The rear wheel, with cush drive and 2LS brakes, isn't magically light but, those shoes sweep some solid surface area and the pull through axles are much nicer to fool with than wheels which aren't with a pull through axle and modern bearings. So 6 leading forward shoes means don't count on having great reverse brakes. 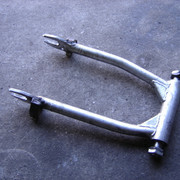 The 4LS is an ARMHA or WERA road racing legal thing with the 35mm forks fitted to the Marzochhi trees also having to do with class eligibility. The reservoir rear shocks would have to be replaced for several classes, if not all it would be competitive in, but fine for street use and they are cla$$y pieces. Engine and trans built several years ago by Muskie at Departure in Virginia and it has around 50 miles on it, all in this frame. Last ride on it was over 130 mph, it is very strong and sounds amazing when all buttoned up and going. The long Bub megaphones, no longer made and it has an extra pair, are lightly baffled yet straight through and sound mello yet angry. Less antisocial and better sounding than straight pipes, easier to tune, yet, loud enough to be heard and piss off a neighbor that may be too sensible. Split port primary and secondary all the way through the manifold and to the ports. Mechanically linked carbs and the secondary doesn't open until you twist the throttle enough. 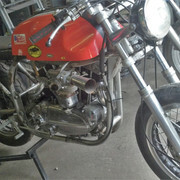 The little primary carb will run it and sustain around 60 mph on flat ground. Kick start it cold and lean with throttle opened too far and the secondary is subject to shoot a huge fireball forward more than 6 feet, which is right in the ballpark length the runner would have to be to contain the 1st pulse. Never tried to see how big or far a fireball it would sneeze. Hahaha, I know the AHRMA and WERA regulations well and is why I ran 35mm Cerianis, the 4LS and Redwing Hammerheads. I used to get a particular Ferodo lining (can't remember which one, 2520V?) from Michael at Vintage Brake and the Water Buffalo front brake was an easy two finger affair at places like the fast back straight into the relatively sharp left hand turn 10a at Road Atlanta. Ironheads into a Featherbed frame. I call mine "Sportons". I've done 3 of them. It's no where near as hard as some people (who have never done them) will tell you. The dilemma of the chain run ? I found out years ago that there really sin't one. Once you understand that the Ironhead engine isn't symmetrical like Triumphs and Nortons and the center line of the engine doesn't matter when building this combination, it becomes pretty easy. 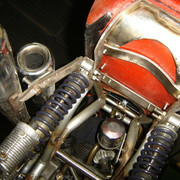 All you need to do is offset the engine so that the chain run runs inside the rear down tube. I was told by a number of people that the frame had to be altered to do this. Untrue. Their is enough clearance. For Historic racing I don't think you could find a better combination. 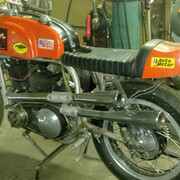 Possibly a Vincent engine (Norvin) but a tired Vincent engine will set you back $25 grand. 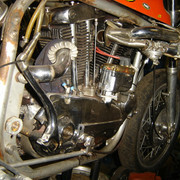 The real problems with running stock Sportster frame is the suspension and brakes. Not so much the frames. "I know only too well the evil that I propose. But my inclinations get the better of me."